HONOLULU - President Obama's Hawaii retreat has been about as close as any president can get to a real vacation. At the risk of jinxing Mr. Obama, so far no major crisis or controversy has intruded into his get-away. At times the trip has been an Obama "sports camp." The president has enjoyed golf and almost daily workouts at the Semper Fi gym at a nearby Marine base. The base was also the scene as the president went bowling and played basketball with daughters Sasha and Malia. Mr. Obama treasures his vacation privacy. 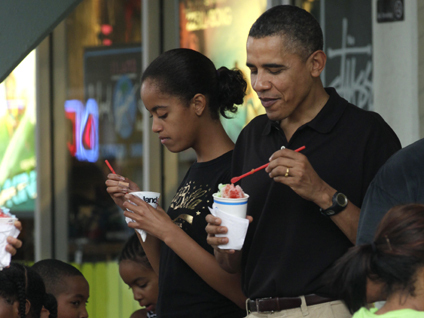 He made the first truly public appearance of his vacation Monday when he stopped by one of his favorite local places, Island Snow, a shop that sells Hawaiian snow cones known as "shave ice." Dressed in a dark polo shirt, khaki shorts and decidedly non-presidential flip-flops, he ordered treats for himself, his daughters and a group of young friends. The Commander-in-Chief told his young charges, "once you've ordered, go back." The president paid the tab and left money in the tip jar. For the record, he chose a melon, cherry and lemon-lime ice, proclaiming it "really good." Continuing the family vacation theme, the Obamas went snorkeling today at Hawaii's famed Hanauma Bay State Park. The park is closed to the public each Tuesday so the first family had plenty of privacy as they enjoyed the underwater vistas of colorful fish and coral. The White House also went to great lengths to assure their solitude. The media pool of reporters and photographers was kept far from the bay. Photographers were told there would be no photos of the Obamas during the snorkeling expedition. Weather kept the president away from the golf links yesterday and so far today too. Hawaii has been pelted by heavy rain that will become a major ingredient for the storms headed to California. National Weather Service meteorologist Robert Ballard said "moisture from this system is being injected into the system" hitting Southern California today. A second straight day of stormy weather caused scattered flash flooding and minor landslides in Hawaii. For the White House, statements by Hawaii's new governor Neil Abercrombie were almost as unwelcome as the foul weather. Deputy Press Secretary Bill Burton responded with a terse "no thanks" when asked for a comment on Abercrombie's plan to take on the "birthers," people who question Barack Obama's U.S. citizenship. The White House clearly believes it did away with the questions during the '08 campaign when it released Mr. Obama's Hawaiian "certification of live birth." Baby Obama's birth announcement from the local newspapers was also produced. While the White House views the issue as closed, it is personal for Abercrombie who is a longtime Obama family friend. He used interviews with a number of news organizations to to voice disgust with the "birther" movement. Abercrombie remembers when Barack Obama was born in Honolulu. He told CBS affiliate KGMB-TV, "This has to do with the people in Hawaii who love him, people who loved his mom and dad. This has to do with the respect of the office the president is entitled to." Abercrombie added, "It's an insult to his mother and father. How would anybody like to have their mother and father in that kind of situation? I was friends with his mom and dad." It remains unclear how Abercrombie will be able to produce any evidence that would silence politically-motivated Obama critics. He told the Honolulu station, "We have to take a look at what we can do with that. But I can't imagine that we can't find some way to see to it that those who are honest about it, that don't have a political agenda could have no further argument about it." Of course, reporters covering the president were grateful to the governor for providing some substance during the president's so-far quiet Hawaiian stay. One cable TV correspondent has resorted to doing live-shots in a traditional Hawaiian "aloha shirt." In an editorial headlined "Reporting live in my Hawaiian shirt," the Honolulu Star-Advertiser poked fun at the coverage. It said, "The news reports themselves are fluff, but for the tourism industry, any live shot with palm trees in the background is all good." Joking aside, being a reporter on the presidential beat can be compared to the job of a firefighter waiting for the alarm to sound. Presidents are never really on vacation. Last year at this time, the White House media were reporting on the administration's response to the terrorist who tried to bring down a commercial jetliner with explosives concealed in his underwear. The president travels with a staff that reflects the same presence seen at the White House. His national security and press office teams are with him. Dozens of other support personnel keep the president in contact with the White House situation room and key aides back in Washington. Of course, the Hawaiian 78 degree "wind chill" is a nice break from the weather that awaits reporters back in D.C.